UNLV is 16-13 overall and 9-9 in the Mountain West, meaning the only chance it has at an NCAA Tournament berth is winning the conference tournament. But the Lady Rebels have three wins in their past five games. 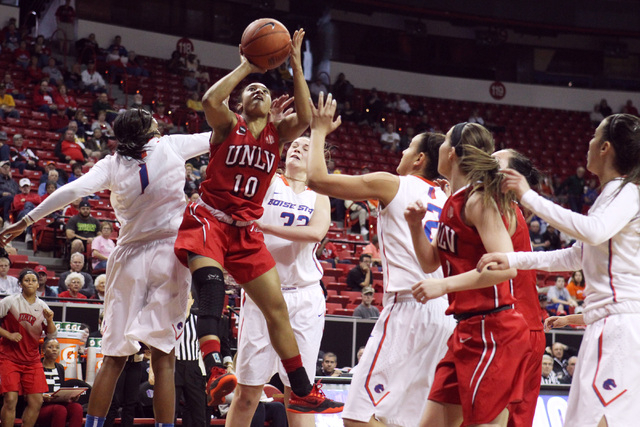 UNLV was a tiebreaker away from having a day off Monday and a bye in the first round of the Mountain West women’s basketball tournament. But coach Kathy Olivier said the coaching staff tried to push that possibility out of its mind. “Whatever the seed was going to be, we (were) going to say, ‘We love this spot. Let’s run with it,” Olivier said. So, by virtue of playing — and losing — an extra game against conference leader Colorado State, the Lady Rebels lost their tiebreaker with New Mexico and will host Air Force at 7 p.m. Monday at the Thomas and Mack Center. UNLV is 16-13 overall and 9-9 in the conference, meaning the only chance it has at an NCAA Tournament berth is winning the conference tournament. But the Lady Rebels have three wins in their past five games — including Friday’s regular-season finale — and sophomore Nikki Wheatley said she thinks the team is playing well. The Lady Rebels have beaten Air Force, the bottom seed, twice this season. 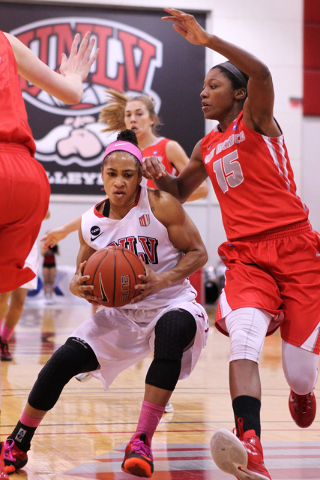 But the Falcons (1-28) played UNLV close in both games. UNLV won 60-56 in January in Colorado and 62-51 at home in February. Air Force is in its first season under coach Chris Gobrecht, and Olivier said the Falcons seemed more settled the second time UNLV played them. In a conference full of parity, Olivier said she thinks any team from the third seed to the ninth could beat any of the others. If the Lady Rebels defeat Air Force, they will meet third-seeded Boise State (19-10, 12-6) at 8:30 p.m. Tuesday in the quarterfinals. The teams split the season series 1-1. UNLV was eliminated by Boise State a year ago, 62-44, in the conference tournament quarterfinals. Just four players on the Lady Rebels’ roster played in that game. And though the roster is comprised primarily of underclassmen, Olivier said her team isn’t young anymore. In other first-round games Monday, San Diego State and Wyoming will meet at 2 p.m., and Utah and UNR will play at 4:30. The quarterfinals are scheduled for Tuesday, the semifinals Wednesday and the championship at noon Friday. Betsy Helfand can be reached at bhelfand@reviewjournal.com. Follow on Twitter: @BetsyHelfand.